The Dutchman’s Puzzle pattern is a simple 4-patch blockconstructed of pairs of Flying Geese blocks. An old design, it originated in the very late 1800s. It, or some variation of it, is frequently referred to as a Windmill block because the spiral of triangles is reminiscent of the famous Dutch windmills. 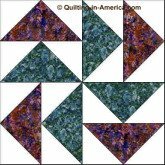 Easy instructions for making a Dutchman's Puzzle quilt using precut 10" squares (layer cake).